Well hello Family! It has been a while since I have written anything but I hope this blog turns in to many! It is amazing how we get so sidetracked in this thing called life. We made our first video the other day and we are hoping to continue with that as well. So we won’t only be blogging but vlogging as well. A year or 2 ago I had a dream. That dream was to be able to reach out to people all over the nation with our stories, recipes, crafts and to be able to do this working side by side with my Daughters. We took off with all sorts of dreams and plans but shortly after it seemed everything was falling apart. Nobody had time, everyone was busy and we really didn’t think about it too much. Well about a week ago this dream was given back to me, you see there is a plan for my life, there is a plan for your life unfortunately we get easily distracted. Sometimes it’s money, sometimes it’s things but if you have something buried down deep inside of you that you want to achieve it doesn’t matter the distraction that dream will come back to you. Grab it by the reigns and give it everything you’ve got to make it too fruition! Don’t wait another day! Put that dream on the front burner! A wise man once said.. If you can imagine it you can achieve it! If you can dream it you can become it! Ok so now I will get back to the recipe..I don’t know if I needed to hear that or I just got somebody stirred up because they have a dream waiting to come out! 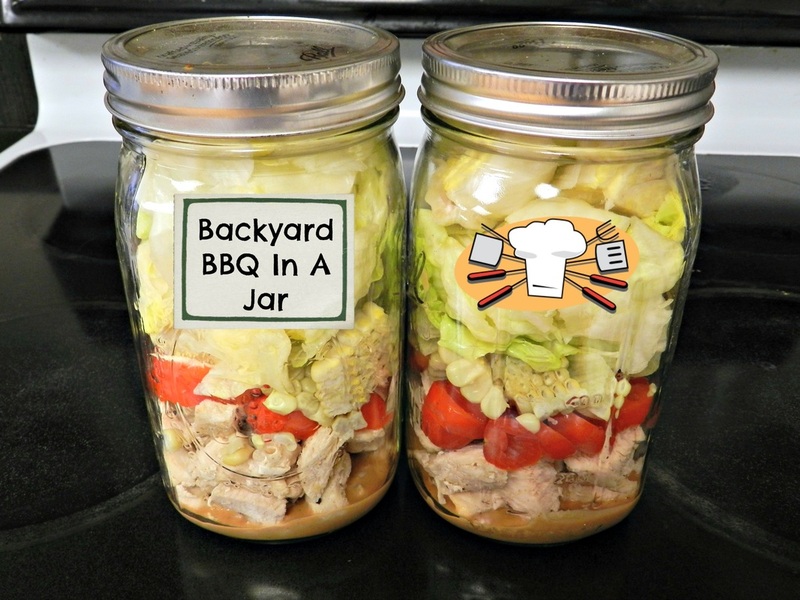 So anyway here is the recipe for my Backyard BBQ In A Jar.. Put in your sauce and dressing. Always layer sauces first so your lettuce doesn’t get wilted.